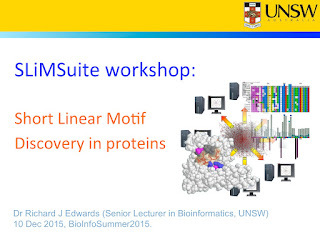 Since the move to UNSW in 2013, the Bioware SLiMSuite servers and REST servers have been undergoing some much needed TLC. 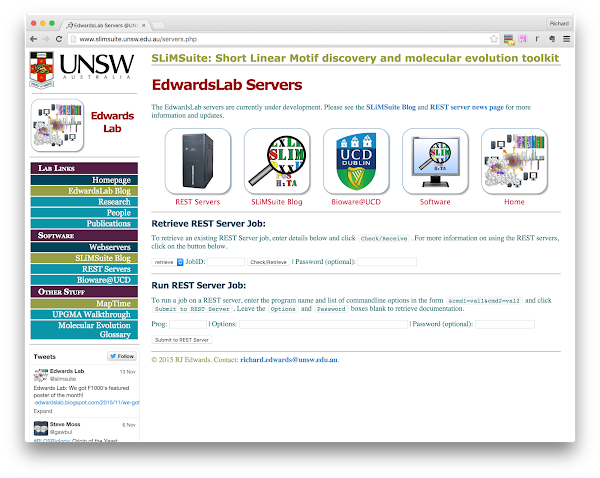 As part of this process, a new set of UNSW REST servers were introduced and online with the 2015-06-01 SLiMSuite release. SLiMFinder de novo SLiM discovery. QSLiMFinder query-focused de novo SLiM discovery. SLiMMaker Simple Regex SLiM generation from peptides. The primary focus has been setting up new servers to be accessed via a RESTful-style interface whereby a URL can be directly given to the server and used to either download results directly (if accessing programmatically) or view in a web browser. As with the main programs, these servers use plain text inputs and outputs wherever. Whilst this probably makes proper computer scientists very unhappy, it should make it very easy to incorporate SLiMSuite REST functions into your own scripts - you only need to learn how to parse text. (It also makes it easy for me to swap input sources.) If you don’t want to write your own, SLiMParser is provided in the SLiMSuite download to do this for you. The other design consideration that has gone into the REST servers is to make them run as much like the commandline versions as possible: (1) they use the same code; (2) they use the same commandline options, parsed from the URL. This means that (a) you should easily be able to reproduce server results on your own system, and (b) new functions (and bug fixes) should become quickly available via the REST servers. To save the need for constructing complex URLs, there is a simple on-size-fits-all form at the EdwardsLab server page. Over time, tool-specific forms will be established. Currently, this only exists for SLiMMaker. As ever, if something about the new servers misbehaves or does not make sense - or you really want some new functions - please get in touch.